This is a quick video of Vegas a little frustrated with his foster mom. His treat was too warm for him to eat right away, and he let me know how he felt with no problem! Has was just too cute about it. In about 5-10min time it was cool enough for him to slobber it down (he has very few teeth) and gobble it up. 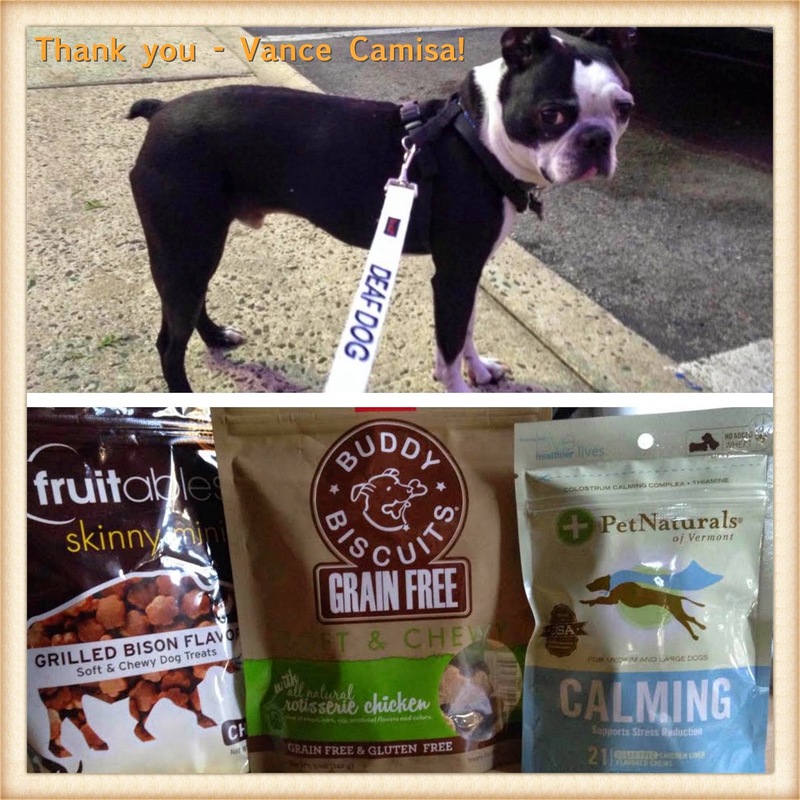 Vegas wants to thank Vance Camisa again for the wonderful gifts! You have been very genres to this wonderful boy! He has enjoyed all your gifts. She is graciously donating cards for us to use when we send out the anniversary wishes to our adopters. Samples of her beautiful designs are pictured above and they feature Walter the Boston Terrier, Rudy the Boston Terrier, Muno the Boston Terrier, and Badger the Boston Terrier. Stop by her shop and say hello! Ozzy received an abundance of gifts over the last week from his Amazon Angels (as I like to call you all)!! - We cannot possibly thank you all enough. He is so stocked up with yummy food. He's perfecting 'giving paw' thanks to the persuasion of all the yummy treats. He loves his bones, blankets, toys and balls. He plays fetch for hours! Also, the ear wipes have been a funny part of his bath routine. He likes them so much that he sounds like he's purring while I'm cleaning his ears! The LED collar has been so fun to have. Oz thinks he's the coolest dog on the block when he has it on! The leash has been a life saver. He was in desperate need of one. Oz will be traveling with me for work - so the car seat cover thing and the seat belt are awesome. He loves going for rides and now he'll be extra safe! If I missed anything - Please know it was loved and appreciated! Vegas enjoys wearing his Thunder Shirt. He was borrowing his foster brothers shirt for a bit and now he has his own nice and spiffy looking shirt. He enjoys wearing it and when taken off, is always ready to have it put right back on. Vegas would like to show Vance Camisa how much he loves his "Multi-Pet Swinging Safari Monkey" toy. Check out his video. Fena loves to sunbathe and is thankful for warmer weather! Mackster loves his new home and his Mom and Dad, Fran and Bill Bremigen, are madly in love with him. This is such a happy ending for him: he came in shy, frightened, hand shy, and totally not in condition. In just a short time, he turned into a loving, confident boy, even had some muscle on him from the frequent walks we took, and charmed the neighborhood. Now he has his own private backyard, a camp in the mountains, and retired parents who can give him the attention he deserves. He has even met some of the children and grand children. Bill and Fran are fantastic, not scared off by the potential for future surgery, and very dog savvy. I could not have asked for a better placement, he's in doggy dreamland! Foster sister Charlie said this is a pay back. She has the chair and I have the ground. I wonder what Pangya did? 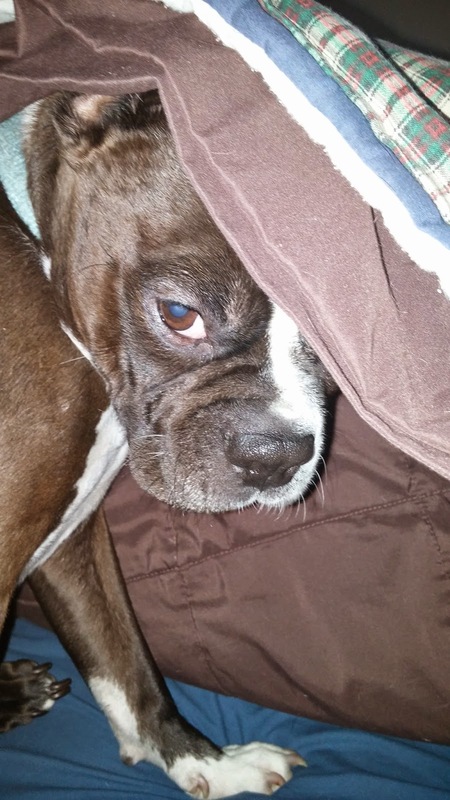 Chloe update from her forever home. Frank is here and settling in. Likes the bully stick. He would not touch it at first. We went for a long walk around the neighborhood to check things out. Will keep everyone posted on his progress. 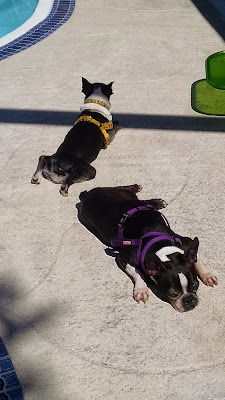 Our two Nebtr former fosters, now forever loved, are enjoying the Florida sun while we are on vacation. Beanie and Goldie are loving this. Too bad we are headed home next week. Beanie's favorite pastime while we are here is chasing tennis balls. Nothing stops him, even if it goes into the pool. He has fallen in twice in pursuit of a ball. Good morning from new foster boo boo! 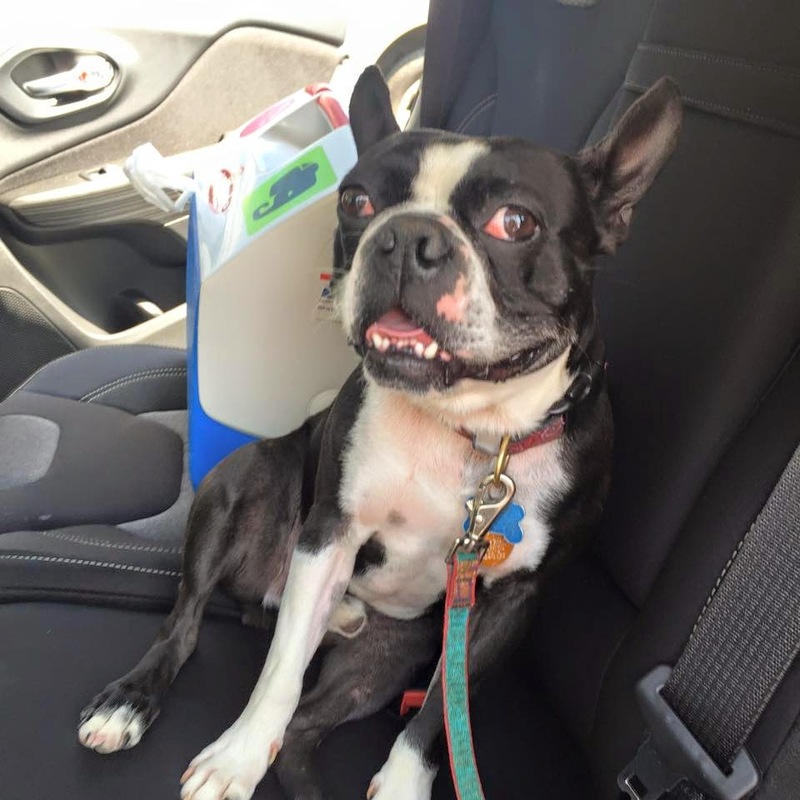 Our former foster, Brain (fka Porter) is living a new adventure with his amazing Dad. They have relocated from NYC to his native hometown in Mexico! Brain now spends his days basking in the sunshine, being spoiled by Grandma and cuddling with his little cousins, whom are his new best friends. This handsome & lucky boy is so very loved!! Check out the Flipagram called "Remy's first year with Yankee ❤️". 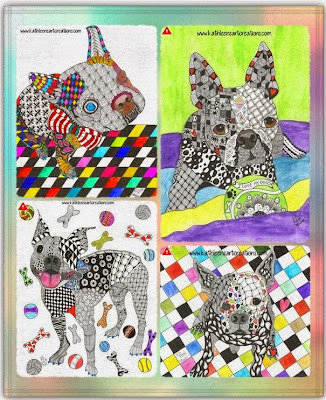 made by his forever mom Gina Escobar. Happy Gotcha Day Remy! 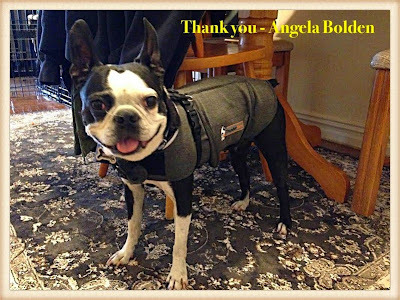 Gina writes, "Thank you for the card! 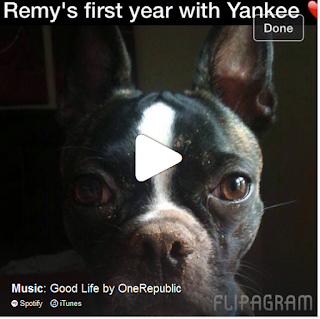 I can't believe it's a year already I have Remy ! I hope you can post and share his first year with me and crazy fur brother Yankee ! Remy is still my wild child, but it's who he is! " 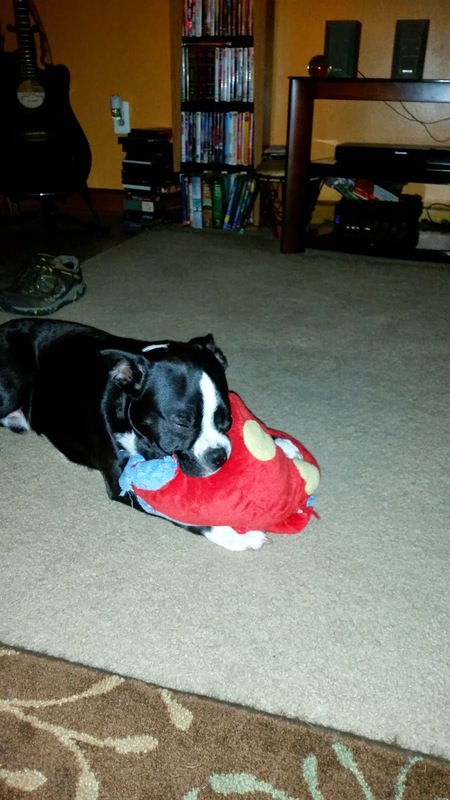 Sully likes to hug and put his mouth on this big toy when he's ready to settle down. So cute!! 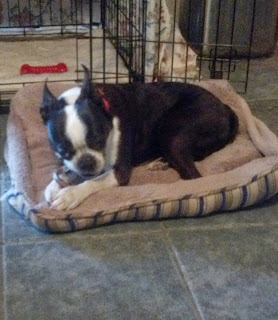 My foster sister, Charlie, got her new foster package today, she was very happy. I'm waiting until she drops that ball toy or the bone. She is very cute, huh? The start of my Sunday... had to do the "Shower March" with my siblings. Went like this; No way, maybe after Lily, No way, Maybe, Alright I'm in. Ugh - Sundays are for catching ducks not showers!